Local Bhutanese English-speaking guide and driver to accompany group throughout. Visit the weavers of Bhutan in the company of renowned textile artist Sue Lawty on a fascinating journey across the kingdom. be the first to review this trip! At the eastern end of the mighty Himalaya lies the tiny Buddhist kingdom of Bhutan. This traditional nation, without doubt, produces the finest woven fabrics to be found in the Himalayan region. Weaving is an ancient art in Bhutan and its textiles are an integral part of its culture and heritage and are unique for their diversity and sophistication. With skills handed down from generation to generation and from family to family, weaving in Bhutan is today an art form that is representative of the very heart of the country. Sue Lawty led our first ‘Weavers Trail’ in 1995 crossing the country from west to east. Our new 2019 itinerary starts in the more remote east and travels west, visiting on the way, among others, the raw silk ‘bura’ weavers in the remote village of Radi, the kishuthara weavers of Lhuntse district and Khoma village and the ‘yathra ‘ weavers of Bumthang. In addition you will be introduced to other regional traditions of silk, cotton, wool, yak and nettle weaving and further crafts such as pottery and paper making, woodcarving and painting and the making of wonderful baskets. This unique trip has been designed to combine first hand experiences of weaving, visits to weavers in their own homes and to the important textiles centres of the kingdom. You will have opportunity to see all the processes involved in producing textiles, dyeing, spinning and weaving as well as the different uses for these textiles, such as in day to day wear of Bhutanese men and women and the rich textiles used for festival attire and religious costumes. This trip weaves together a colourful tapestry of textiles, tradition, rich cultural heritage, warm and friendly people and stunning landscapes, as you gradually travel to reach the capital Thimpu and the Paro Valley. In addition you will visit some of the most iconic temples, monasteries and dzongs of the kingdom, such as Tashigang Dzong and Taktsang Gompa and you will have the opportunity to take some lovely walks through beautiful countryside and to more isolated villages. An additional attraction of this fabulous trip is the opportunity to stay with local families in their homes on two homestay nights where you will eat with the family and learn about day to day life in rural Bhutan. Meal arrangements: As indicated in itinerary. 16 breakfasts, 14 lunches, 14 dinners. Fly to Delhi and Gauhati. Drive to Samdrup Jongkhar. Drive to Tashigang with visit to Khaling weavers centre en route. Visit Tashigang town and dzong. Walk from Tashigang to Kapti. Visit Radi village and Ranjung Gompa. Drive to Mongar with visit to Damatse Gompa. Walk through Mongar market. Drive to Khaine Lakhang. Village walk. Drive to Tangmachu and visit giant Guru Rimpoche statue. Drive to visit Lhuntse Dzong. Drive to Autsho. Walk to Khoma weaving village and the weavers of Gonpa Karpo. Return drive to Mongar and walk to Pangchula Gompa. Full day drive to Bumthang Valley, visiting Ura village and Burning Lake on the way. Visit Tamshing Phala Chhoepa Festival and walk to temples. Drive to Chumey. Visit temples and weavers of Chumey valley. Visit weaving workshop at Zugney. Fly to Paro. Sightseeing in Paro Valley and drive to Thimphu. Cultural sightseeing in Thimphu and visit textile museum and paper factory. Return to Paro. Sue is an accomplished mountain trekker, fell runner and fine artist; and has been a trek leader for us since 1995. She held a year long Residency at the V&A in London, and has been awarded prestigious Artist Research Fellowships at both the Smithsonian National Museum of Natural History, Washington DC and the Faculty of the Environment, University of Leeds. The book 'Earth Materials' was recently published about her work. Trekking journeys include the Alps, Africa, Kashmir, Tasmania, Morocco and New Zealand plus Mustang & Naar-Phu in Nepal. 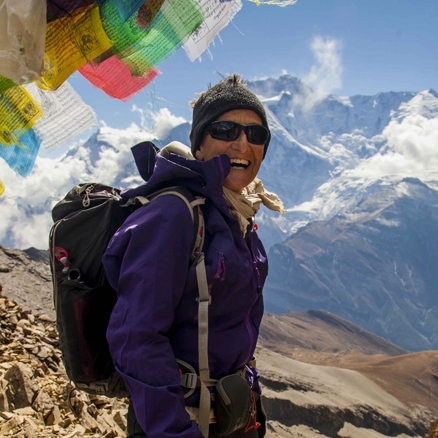 With Mountain Kingdoms she has led numerous successful trips to Bhutan, Dolpo and Zanskar. Day 2 - Arrive Delhi. Group transfer to hotel. Tour of the textile market in Old Delhi if time permits. On arrival in Delhi you will be transferred to your hotel located close to Delhi airport. In the afternoon, if your flight schedule allows, you will have a sightseeing tour of Old Delhi's textile market. This is the place where you can see and buy a vast array of textiles inlcuidng the most beautiful handwoven, cotton fabrics. Day 3 - Fly to Gauhati. Drive to Samdrup Jongkhar - 110km, 3 hours. After breakfast at the hotel you will be transferred to the airport to catch your domestic flight to Gauhati in Assam state. You will be met on arrival and then drive to the Bhutanese border at Samdrup Jongkhar. You drive out of Gauhati city crossing the mighty Brahmaputra River and then through the tea plantations of Assam and across flat plains to reach the border. You will complete border formalities and on the Bhutanese side you will be met by your Bhutanese guide and driver who will drive you to your hotel for the night. Samdrup Jongkhar is located at the very foot of the Bhutanese foothills and is quite subtropical. It is a bustling little town with shopkeepers and hawkers coming over the border with Assam to trade and sell their wares. Day 4 - Drive to Tashigang - 180km, 7-8 hours. Visit to Khaling weavers’ centre en route. You will have breakfast at your hotel and then begin the drive north into the mountains. As you wind your way up there are wonderful views of forested hills and valleys rolling away to the south and the Indian plains of Assam State. You can often see Langur monkeys, kingfishers, eagles and other brightly coloured birds along the roadside. About five hours from Samdrup Jongkhar you reach the village of Khaling, one of the most famous weaving centres of Bhutan, with weavers from here producing cloth for the Bhutanese royal family. The National Handloom Development Project here is operated by the Women's Association of Bhutan and young women from all over eastern Bhutan come to learn how to weave. Here, Sue will introduce you to some of the age old complexities of Bhutanese weaving. From Khaling you climb to cross the Yongphu La Pass at 2,190m/7,185ft, and then you pass through Kanglung and the campus of the country's premier University College at Sherubtse before arriving in Tashigang, the administrative and religious centre of the eastern region of Bhutan. Day 5 - Visit Tashigang Dzong and town. Walk to Kapti village and visit Radi Village and Ranjung Gompa. Although east Bhutan was historically connected to the rest of the country by overland trade routes, these were long and difficult and the people from here often felt more closely connected with their nearer neighbours in Tibet and India and traditionally had closer trade and cultural links with them. This means that the east has a totally different feel to the central and western parts of the country with the eastern region being controlled from dramatic dzongs such as the one in Tashigang and in Mongar, Tashitangtse and Lhuntse. Today, you will have time in the morning to explore Tashigang town, visiting the centre of town and the impressive dzong. The Tashigang town is clustered round a small central plaza with a large prayer wheel, a bank, a few shops and bars but not much else! There is a small souvenir shop here which is not very inspiring. Below the plaza is the spectacular Tashigang Dzong, set on a ridge high above the valley. This dzong was built in the 17th century to guard against Tibetan invaders and was one of the most strategically important in the country. Later you will take a pleasant walk from Tashigang to the village of Khapti. First you will drive to the high court, a handsome building set a little above the town and from near here take a rocky trail which leads up above the town and then continues through lovely forest with lots of birds and wildlife and on through a couple of pretty small villages before coming out on to a new feeder road where you will meet your transport. This will be a pleasant and undemanding walk. You will then visit Radi Village and will also have time to visit the large Nyingmapa Gompa at Ranjung, which has a school for monks attached to it. This region and its villages are famous for their weaving and you will visit local weavers and village homes to see the raw silk textile weaving, known as 'Bura'. From Ranjung the road leads up the valley to Phongme, a village where a trek begins into the remote region known as Merak Sakten, an area where the Yeti (known locally as Migoi) is said to be found. Along this valley you may see the Brokpa people who come from this region - they are easily recognised by their distinctive black felt hats with octopus like tentacles which are created to help to keep the rain out of the wearer's eyes! Day 6 - Drive to Mongar with side trip to Dramatse Gompa - 126 km, 6 hours. Explore Mongar town. Today you will drive to Mongar. On the way you will take a side trip off the main road and up onto a ridge top, 1,350m/4,429ft and 18kms above the river, to visit the monastery of Dramatse. Dramatse Monastery was founded in 1511 by a granddaughter of Pema Lingpa, and is one of the largest and most important monasteries of eastern Bhutan. It is famous as being the place where the Nga Cham Drum Dance, which is featured in festivals all over the country, originates. From Dramatse you will return to the main road and continue to Mongar. Mongar town, like many towns in the east is situated on a hill top, unlike towns of the west which tend to be located in valleys. The dzong is relatively new and the town has busy shops and bars and a bustling fruit and vegetable market which you may explore this evening. Day 7 - Drive to visit Khaine Lakhang. Village walk. Visit the giant bronze statue at Tangmachu. Drive to Lhuntse Dzong. Continue to Autsho. There is a lot to do today, so it is a good idea to try to have an early breakfast and leave in plenty of time. From Mongar, you descend by zigzags all the way down into the valley and then drive up the valley north towards Lhuentse. You drive through some pretty impressive gorges with vertical cliffs, but before reaching Lhuenste, turn off to the left and climb up into the zigzag road into the hills to visit Khaine Lhakhang. This is an incredibly important small temple, one of 108 built by King Songtsen Gampo in AD 659. It is said that three statues flew from here of their own accord to a temple in one of the main valleys of Bumthang. You can park the car at one end of the village and walk along the road to the temple. From here is a relatively short drive to Tangchmachu. This is a small village off the beaten track and really quite remote, but is nevertheless, the site of the largest statue of Guru Rinpoche (height 173ft). The statue was constructed by men instead of machines at the instigation of the venerable Khenpo Karpo Rinpoche. Its purpose is to bring peace and prosperity to the world and for the benefit of all sentient begins. From here we drive to Lhuentse Dzong 1,409m/4,622ft, back down in the main valley. It sits fair and square on top of a steep hill commanding an impregnable position. It is the ancestral home of the kings of Bhutan and was originally established by Pema Lingpa's son, Kuenga Wanpo in 1543. The present Royal family trace their lineage directly to the important saint of Pema Lingpa. A small township straggles the mountainside below the dzong. There are a few shops and a bank, and some very rough lodging houses by no decent hotel. If there is time, we also plan to visit Khoma village. Khoma is said to be the birthplace of the traditional Bhutanse culture of weaving, and is famous for its traditional intricately handwoven silk cloth called Kishuthara. Drive back down to Autsho. Day 8 - Visit Khoma weaving village. Walk to Gonpa Kharpo Lakhang. You will spend this morning at Khoma village which is famous for its intricate woven cloth called kishuthara and is said to be the birthplace of Bhutan's traditional weaving culture. The weavers here produce some of Bhutan's most sought after and expensive kishuthara textiles. Women throughout the kingdom wear kishuthara on special occasions such as wedding and at festivals. You will spend time in Khoma to see the woman working at their looms and also to learn how the local people make vegetable dyes. Later you will walk up to Gonpa Kharpo Lakhang, located on a ridge overlooking Lhuntse, and the centre of another area famous for its weaving. Today you will also see pottery being made and cloth woven from nettles. Day 9 - Drive to Ura - 6-7 hours. Walk down from pass to Ura Village - 1½ hours. A long drive today takes you to the Shertang La pass at 3,573m/11,723ft, situated above the village of Ura. Here you may leave your vehicle and take the walk down to Ura, a pleasant walk, all downhill in lovely forest. When you arrive in this extremely picturesque village, you will visit the small village gompa, dedicated to Guru Rimpoche, and will then walk through the medieval looking streets to reach the Bangpa Heritage Farmstay, a large traditional farmhouse offering comfortable if simple accommodation. Day 10 - Drive to the Chumey Valley - 1 hour. Visit weavers and temples of the valley and the weaving workshops at Zugney. Visit Tharpaling. After breakfast you drive to the Chumey Valley. This area is especially famed for its weavers and you will visit some weavers in their homes, as well as the famous weaving workshops at Zugney. You will see women working on backstrap looms, creating 'Yathra' designs, a colourful weaving technique of intricate patterns woven in the coloured wool native to the Chumey valley. You may also see other processes involved in weaving such as the dyeing of wool, using natural dyes. Here in Chumey valley you may also visit the Nyimalung Monastery. Founded in 1938, the monastery is home to over 100 musically talented monks. From here you can walk down in 10 minutes to visit Prakhar Monastery a quaint village temple. You then drive up to the cluster of temples at Tharpaling - a sacred spot and place of meditation, founded by Geluwa Lonchen Rabchampa (1308-1363) during his self-exile from Tibet for ten years. Several picturesque monasteries dot the hillside with views over Domkhar (Chumey) and Domkhar Summer Palace. You might like to walk up from the temples to the top of the ridge above, Shutre Sae Pass at 3,700m/12,139ft, from where the views are phenomenal - looking south you can see over the Chumey Valley with the Black Mountains in the distance and the other way you get fabulous and unexpected views over Jakar town with the airport runway and the dzong clearly seen far below. Beyond and further north, you can see towards the high mountains, perhaps on a clear day even as far as Mount Gangkar Punsum. You will then drive on to Jakar, a beautiful valley in the Bumthang region. Day 11 - Valley walk to visit various temples. Depending on the programme at the Tamshing festival you may visit there first today or you may walk there via the other temples of the valley. Your guide will discuss this with you. The main temples of the valley are within easy walking distance from your hotel, or you may drive to them. Nearest to the hotel is the Jambay Lakhang, one of the country's oldest temples, built in the mid-7th century. Look out for the set of three steps in the main temple. The first step, now hidden below floor level, is said to represent the time of the past or 'historical' Buddha, the second, very well worn, step represents the present Buddha, whilst the third step above, is said to represent the age of the future Buddha. The point at which the second step is worn down to ground level is held to be the time when the world as we currently know it will end. From Jambay Lakhang you may walk along a farm track for 30 minutes to reach Kurjey Lakhang, a series of three large temples. The oldest of the temples here houses a rock indented with the body shape of Guru Rinpoche, whilst the most recent dates back just 30 years and was built by the Queen Mother, Ashi Kesang Wangchuck. To reach Tamshing Lakhang you may either drive from your hotel or walk from Kurjey Lakhang, descending to cross a suspension bridge and walking downstream for a further 45 minutes. Tamshing Lakhang is the most important Nyingma Gompa in the kingdom and was established in 1501 by Pema Lingpa, a popular historical Bhutanese religious figure. Day 12 - Fly to Paro. Sightseeing in Paro township. After breakfast you will be transferred to the airport for the flight to Paro which takes about 35 minutes. On arrival you will be met and taken to your hotel in Paro. In the afternoon you will be able to explore the township of Paro before transferring to a traditional farnhouse homestay in the Paro Valley. Note: If the flight from Bumthang to Paro does not operate today you will need to drive to Thimphu over the next two days instead. Day 13 - Sightseeing in the Paro Valley. Drive to Thimphu - 1-2 hours. Today you will spend sightseeing in the Paro Valley. The Paro Valley had a great strategic importance in the history of Bhutan and was in past centuries an important staging post on the trade routes with Tibet. Paro Dzong, situated on a rocky outcrop above the Paro Chu and with views down both sides of the valley was historically one of Bhutan's strongest and most strategic fortresses. Before the rebuilding of the Tashidodzong in Thimphu it was also the seat of Bhutan's National Assembly. Today you will visit the historic Paro Dzong, and the National Museum housed in the old watchtower above the dzong. The museum holds a fantastic collection of Bhutanese national treasures including the King's famous 'dragon hat', a wonderful collection of Bhutanese stamps, highly decorated thangkas (painted religious hangings), statues and weaponry. The museum may be housed in a nearby building while renovation is taking place after the watchtower was damaged in an earthquake several years ago. You will also visit the ancient temple of Kyichu Lhakang, one of the oldest and most beautiful temples in Bhutan. According to tradition the 7th century temple is said to have been one of 108 temples built by the famous Tibetan king Songtsen Gampo to pin down an enormous demon that was believed to be thwarting the establishment of Buddhism in the region. You will also visit Dungtse Lakhang, a small chorten-shaped temple, built in the 15th century by the great bridge-builder Thangtong Gyelpo. You will also drive up the valley to Drukyel Dzong. Drukgyel Dzong was built in 1649 during the time that Bhutan was resisting foreign invasion and consolidating its power, and it was an important base for defense of the region right up until 1951 when it was destroyed by fire. Some imposing stone walls and rammed earth ramparts still remain to indicate what an impressive structure it must have been. From here there are good views to the north and if the skies are clear you can see Mount Chomolhari, the second highest peak in Bhutan. Later in the afternoon you will drive to Thimphu, the capital of Bhutan. Thimphu has an attractive valley location and is relatively small and intimate for a capital city although it has grown greatly in recent years. There are many places of interest to visit there. Initially you might like to drive up to see the giant Buddha figure and enjoy the views over the town. Day 14 - Sightseeing in Thimphu including the Textile Museum. You will spend today sightseeing in Thimphu. First stop will be the Textile Museum, which gives a good overview of Bhutan's textiles and weaving methods, which as you will have already seen, differ quite substantially from region to region. Exhibits introduce the major weaving techniques, styles of local dress and textiles made by both women and men. Today you will also see another traditional Bhutanese craft on a visit to the handmade paper workshop to see the processes involved in making paper. The paper made here is based on materials unique to the Himalaya, the bark of the Daphne Papyri, which is found at altitudes of 3,000 feet and above, the bark of the Edgeworthia Papyri and various additional ingredients like flowers and leaves which add textures and patterns. There are some nice items made from handmade paper for sale there. There are many other places of interest to visit in Thimphu, including the Tashichhodzong (the main government buildings), the Heritage Museum, the late King's Memorial Chorten, the National Library, the School of Painting and silversmiths and pottery workshops. You could also visit the Government Handicrafts Emporium to look for local handicrafts on sale. You could also visit the Post Office to buy some of Bhutan's very attractive stamps - they will even print a valid stamp with your face on it while you wait! They also have good t-shirts on sale. While in Thimphu you might also visit the 'zoo'. This is in fact a very large enclosure (several acres) just above the town, containing only Takin, the very rare animal found exclusively in Bhutan and parts of China and possibly one of the most quirky and strangest looking animals you will ever see. Day 15 - Visit the weekend market in Thimphu. Drive to Paro. Time at leisure. This morning you will have the opportunity to visit the farmers' market at Thimphu which takes place from Friday to Sunday each week. This is one of the largest domestic markets for Bhutanese farmers and a great opportunity for doing a little people watching. It attracts nearly the entirety of Thimphu's population along with many valley residents who all converge on the market to buy and sell a wide variety of foodstuffs as well as local arts and crafts. The market provides fantastic photo opportunities and a chance to interact with the locals and to buy some souvenirs to take home. Later, you drive to Paro and have the rest of the day at leisure. Day 16 - Walk to Taktsang Temple - 4-5 hours. Today you will walk up to the famous Tiger's Nest, Taktsang Monastery, a fitting climax to your trip. The monastery is perched some 600m/2,000ft up on a cliff overlooking the valley and was said to be where the legendary Indian saint, Guru Padma Sambhava, flew from Tibet on the back of a tiger to defeat five demons who were opposing the spread of Buddhism in Bhutan. It's a steep uphill walk of about 1½-2hrs through woods to reach a tea house (an ascent of 340m/1,115ft). Apart from offering welcome refreshment this tea house is one of the principle viewpoints of the monastery, and those who prefer not to climb any further can relax here whilst others continue on. If there is a particular religious gathering or VIP visit in progress, you will not be able to enter the monastery but the further half an hour's ascent from the tea house is well worth it in any case, as it brings you to another viewpoint directly across from the monastery. If you are able to make the visit to the temple, the final section of the walk takes you from here steeply down approximately 100m/330ft into the gorge that separates you from the monastery and then climbs back up again to reach the monastery gate. You descend back to the valley floor the same way to where your vehicle will be waiting. The full walk to the monastery and back involves approximately 740m/2,428ft of ascent/descent. Day 17 - Fly Paro to Delhi. Today you will say a sad farewell to your local guide and driver and fly to Delhi where you will be met and taken to your hotel. You will be at leisure for the rest of the day to either relax at the hotel or perhaps to venture into the centre of the city - there is a metro station not far from the hotel. Day 18 - Group transfer to airport. Fly to London. After breakfast you will be transferred to the airport for your flight home.